Those were very kind words. This seller was properly prepared and he and his spouse were going to be able to benefit from tax-free gains because they were doing a share sale of their business. 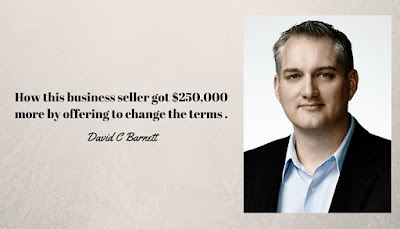 He had come to me for advice on the negotiation and I showed him a way to get the buyer to agree to a price that was $250,000 higher than what they had previously agreed to by offering to change the terms of payment. Having the correct advisors working with you in a complex transaction like this is worth every penny. When it comes time for you to buy or sell a business, give me a call for help. Do you live in Toronto? I’ve got three workshops coming up for Toronto in September. Book now to get summer special ticket pricing. http://davidbarnett.eventbrite.ca Some sessions have fewer than 20 seats left.